Globally, fish keeping is the second most popular hobby in the world, next only to photography, with a value of more than 10 billion dollars annually. India’s share of the international ornamental fish trade is marginal but has been able to show consistent growth over the years. Of the total ornamental fishes traded by India, approximately 85% are native fishes sourced from the Western Ghats and North East India, which are two major biodiversity hotspots. Views on the suitability of species for ornamental trade vary, but up to 187 species have been considered to have ornamental value. 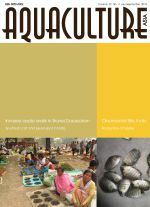 The aquaculture of native fishes in seasonal water bodies can play a role to generating livelihoods and minimising threats to endemic and rare varieties of native fish species. Seasonal water bodies are those aquatic resources that fill up on the onset of monsoon such as ephemeral streams, ponds, wetlands, roadside canals, paddy fields and ditches. Such water bodies can be tapped successfully for culture of small colourful fishes instead of depending on nature for stocking and dispersal. 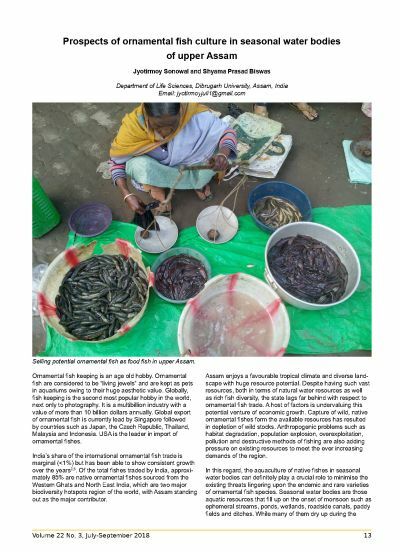 Due to many constraints, the ornamental fish trade in the region has remained very much nascent and untapped, and most fishes with ornamental potential are primarily utilised as food. Imparting sound knowledge regarding ornamental fish trade and establishing market linkages would be the first step towards successful ventures into this lucrative business.